Mahavir Mandir of Patna is one of the holiest temple of Lord Hanuman in India and second most visited religious shrine in North India. Daily thousands of devotees throng the temple and get solace from the worship of Hanumanji. Mahavir Mandir, Patna is one of the leading Hanuman temples in the country. It is a ‘manokamana’ mandir where devotees’ every wish is fulfilled and this is the reason for ever-increasing number of devotees in the temple. As per the Patna High Court judgment in 1948 the temple exists since time immemorial. But from the of historical facts and traditions it appears that this temple was originally established by Swami Balanand, an ascetic of Ramanandi sect in around 1730 A.D. Upon arriving Patna by train one happens to see the famous temple of Lord Hanuman. Long winding queues can be seen at the temple on Saturdays and Tuesdays,the traditional worshiping days of Lord Hanuman. Thousands of people visit Mahavir Mandir on every Ram Navami and New Year celebration. On every Ram Navami waiting queues grow up to some kilometer long. The first establishment date of temple is unknown. This temple gained popularity in 1947 with large number of Hindu refugees coming to Patna after the partition of India. Subsequently, temple was rebuilt as a concrete house at same time. Even this was broken down in 1987 to make a huge marble temple. The idol of Sankat-Mochan stands in it. The Mahavir Mandir Trusts have the second highest budget in North India after the famous Maa Vaishno Devi shrine. 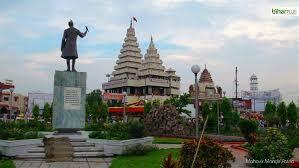 The earning of Mahavir Mandir has gone now up to an average of 1 lakh per day.